Upper eyelid retraction is an occasional complication of upper eyelid ptosis surgery. If this overcorrection is minimal, it can frequently be corrected by the patient stretching the upper eyelid without secondary surgery. 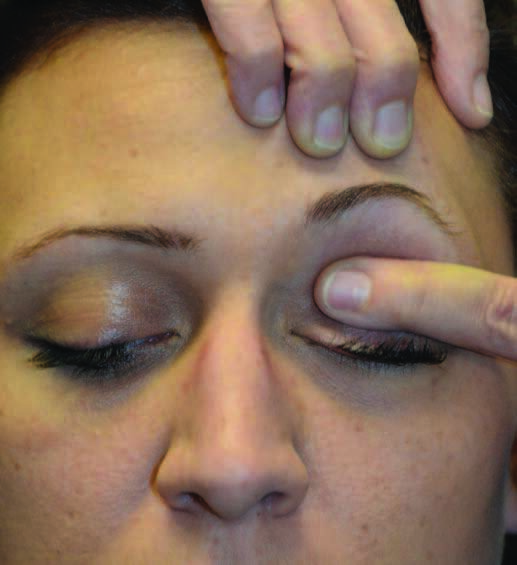 The patient pulls the brow upward with the fingers of the opposite hand while applying the index finger of the hand on the affected side to the area of the lid crease in a horizontal direction (Fig. 1). The index finger pushes inward and downward for several seconds. The index finger is then released while the fingers above the brow continue to hold the brow upward. The index finger is then reapplied to the lid and the patient repeats the inward downward lid stretch. This maneuver is repeated multiple times over 30 to 60 seconds, and is repeated two to six times per day. The patient is instructed that if the upper eyelid reaches a position similar to the level of the opposite lid, or below, the treatment should be discontinued. If the retraction then recurs, the patient is instructed to resume the maneuver. Fig. 1. Demonstration of treating over-corrected upper eyelid ptosis by pulling the brow upward with the fingers on the hand of the opposite side while applying the index finger from the hand on the side of the retracted lid in a horizontal direction, while pushing that index finger inward and downward. Fig. 2. Demonstration of treatment of lower eyelid postblepharoplasty ectropion-retraction by applying the index finger of the hand on the side of the affected lid in a horizontal direction 5 mm below the eyelid margin and pushing that index finger inward and upward. 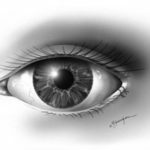 If the lower eyelid is ectropic, or retracted, following a lower blepharoplasty, a stretching of the lower eyelid can be performed by the patient. The patient is instructed to apply the index finger of the hand on the side of the lower eyelid malposition in a horizontal direction approximately 5 mm below the eyelid margin (Fig. 2). The index finger then pushes inward and upward to stretch the lower eyelid. This is held for several seconds and then the finger is released from the eyelid and the maneuver is repeated multiple times over a 30- to 60-second period. This is repeated two to six times per day and is discontinued when the lower eyelid ectropion, or retraction, is corrected. 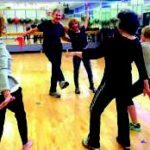 Although these techniques seem relatively simple, I have found that most patients end up doing them incorrectly and therefore without results. Also, many surgeons instruct their patients to use other eyelid massage techniques that are ineffective. It is important to demonstrate the techniques with the patients holding a mirror in front of their eyelids and to be sure that they can perform them before leaving the office. Giving the patient a photograph of the technique or a photograph or video of their performing the maneuver can also help compliance. I have used these techniques for over 40 years with excellent results in the treatment of minor overcorrected upper eyelid ptosis and lower eyelid postblepharoplasty ectropion-retraction cases. I have also found that patients have better acceptance of these complications if they are involved in the correction of them. Patient provided written consent for the use of patient’s images. This work was supported by an unrestricted grant from Research to Prevent Blindness, New York, New York (EY001792). The author has no financial interest to declare in relation to the content of this article.